3. 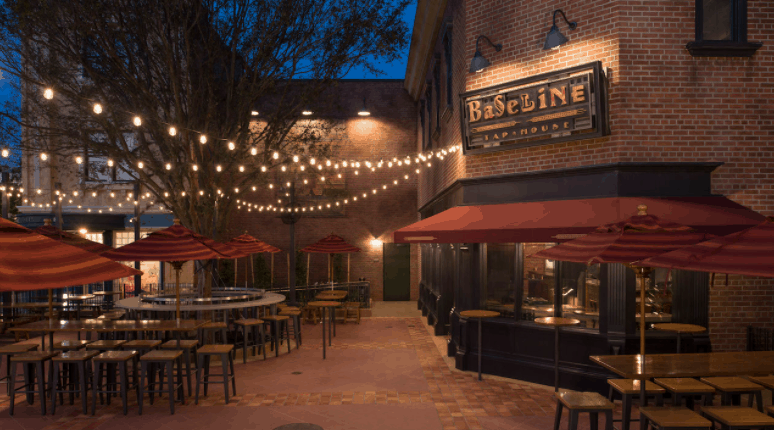 BaseLine Tap House – The Grand Avenue area of Disney’s Hollywood Studios has recently undergone a transformation that now emulates the feel of a small city street in a cozy California town. Part of the new feel of the area is thanks to a new eatery across from Star Tours – The Adventure Continues and just around the corner from Muppet Vision 3D. BaseLine Tap House features a small interior filled with industrial exposed brick, rustic details, and amazing menu options. The exterior of the eatery features a large patio filled with umbrella covered picnic tables for guests to relax at. Overhead, twinkling lights bring charm to the patio at night and large fans are there to help with the typical Orlando heat. BaseLine Tap House specializes in food and beverages inspired by and from California and guests can sip on beer and wine on tap from the popular state. In addition to the delicious beverages, guests can order up some small bites that pack big flavor. Popular menu items include the Bavarian Pretzel which is served with Beer-Cheese Fondue and Spicy Mustard and the California Cheese and Charcuterie Plate.